What Are Makizushi Rolls in Japanese Cuisine? Makizushi is a type of Japanese sushi roll filled with various fillings. The term makizushi refers to the fact that the sushi is rolled—maki means "to roll," and zushi is the conjugated version of the word "sushi." Makizushi is the best-known type of sushi outside of Japan. It's common for people to use the term maki sushi when referring to makizushi. This is primarily a mistake in pronunciation and spelling—an easy one to make, given these rolls are a type of sushi. Makizushi can also be referred to as nori maki or norimaki because the sushi rice and fillings are all wrapped up or rolled inside roasted, dried seaweed. In Japanese cuisine, this seaweed is known as nori. Makizushi and norimaki are often used interchangeably as a general category for sushi rolls. They can also refer to larger or fatter sushi rolls, such as futomaki. On the other hand, thin sushi rolls are referred to as hosomaki or thin sushi rolls. Hosomaki typically have only one filling ingredient. To make makizushi, various ingredients are rolled with sushi rice in nori and then sliced into bite-sized pieces. They're meant to be eaten in a single bite and are often dipped in soy sauce. It's also common to serve the rolls with wasabi (Japanese spicy horseradish) and pickled ginger known as gari shoga. Makizushi is perfect for appetizers or finger food at parties or potlucks. In Japan, it is often prepared for celebrations. Versions of makizushi with vegetable or pickled fillings may also be included in a Japanese bento lunch. Canned tuna, vegetables, and eggs may also be used as fillings. The most important element in makizushi is the rice. 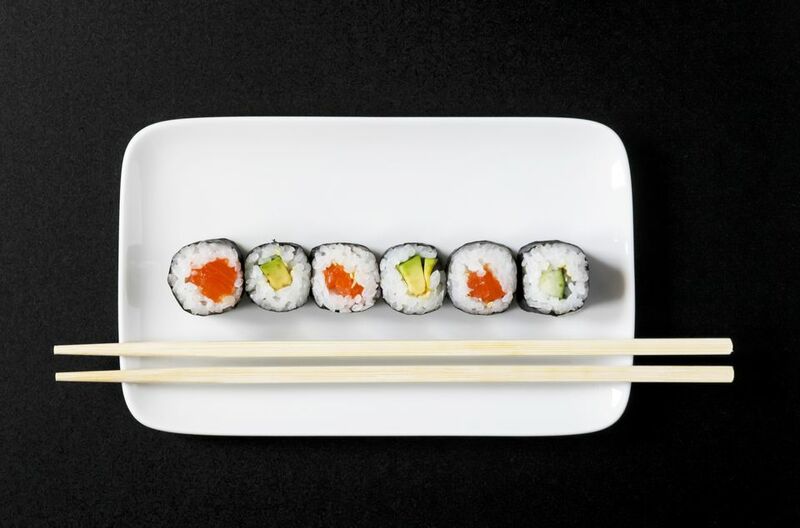 You should only use sushi rice, as it is stickier than other types and will not fall apart in the rolls. Sushi rice can be made at home with just a few ingredients. Many stores also offer pre-made dried sushi rice mixes in packets. You'll also find bottled and seasoned sushi vinegar at markets that cater to Japanese foods. Once you have the rice, you will need to learn the skill of rolling makizushi. A bamboo sushi mat is an essential tool that makes this a much easier process. Rolling is relatively easy, but it will take some practice to get right. Don't worry about messing up at first, your mistakes will still taste great, they may just fall apart. You will find it very helpful to watch a few videos online to see the technique in action. The inside of the makizushi should just be rice and fillings. The nori should not be seen spiraling inside a properly made roll. To ensure this, when you place the rice onto the seaweed, don’t place it directly in the middle. Place a sheet of nori on the bamboo mat with more room on the side of the mat that is farthest away from you. Spread out the rice across the nori. Leave about a 5-millimeter (about 3/16-inch) gap between the rice and seaweed on the edge closest to you. The other side needs a gap of about 3 centimeters (about 1 3/16 inch). The rice should be layered about 5 millimeters thick. Flatten it out so the rice on the ends is slightly thicker than the middle. Cut thin strips of your fillings and lay them out in a single line across the middle of the rice (not the center of the nori). The fillings should take up no more than about one-third of the rice. Pick up the edge of the mat and nori closest to you and begin to roll it up and away from you. When the mat is about to fold into the roll, pull up on its edge and line it up to the far end of the mat. You can then use the thin slats of bamboo to finish shaping the roll. Gently, but firmly, squeeze and press the roll inside the mat as you work to the end of the mat. By the time you reach the end, you should have a nicely formed and well-packed roll of makizushi. Cut into six to eight equal pieces.